The Zurich-based team created an installation meant to recreate the experience of flying for the Oculus Rift. Unlike, say, Microsoft Flight Simulator, this software wants to capture the feeling of actually moving through the sky like a bird. Apparently, the 3-D environments created for the Oculus Rift were not immersive enough. This contraption features sensors that record “wing” movements, a fan to simulate headwind, and even an “olfactoric feedback” system that releases different scents depending on the scenery below. Since being bought by Facebook in March for $2 billion, Oculus VR’s virtual reality hardware has been used to do everything from drive tanks to walk around the starship from "Star Trek: Voyager." Experience bird-watching from the bird's point of view, because boredom helps build character. While not commercially available, anybody can buy the latest Oculus Rift development kit for $350. 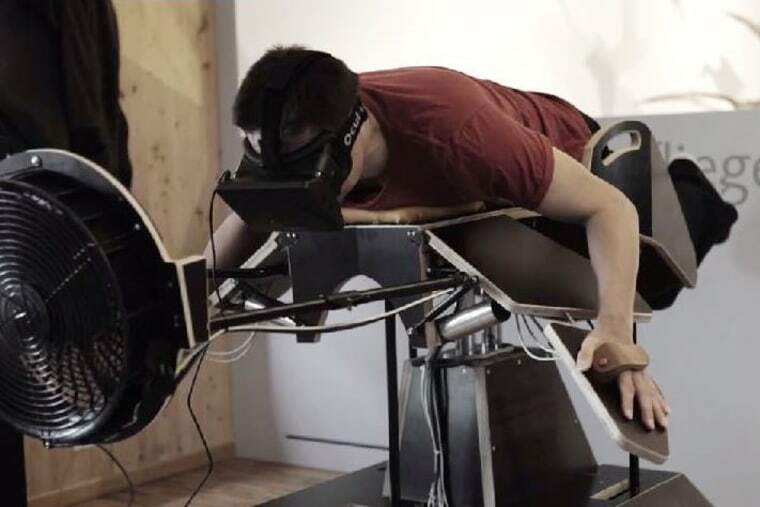 Sadly, Birdly is not likely to show up in stores anytime soon.